Well well… this hasn’t been the most active blog in blogging history, has it? Fear not, my nerd loving brothers and sisters! I am here today to give you the most invaluable organising tip you will ever read… in the next… hmmmm… let’s say… 5 seconds! If like me you also despise loopy rows, fear not my fellow crocheter, for I have got your back! Today I will show you how to avoid those extra loops using the loop-free hdc stitch! We don’t always wear the same colours, we are not always on the same mood… heck! We always wake up to a brand new day! Why keep wearing that same old scarf? So I came up with this brilliant idea of making a Mix & Match Scarf!!! Decoupage is the art of decorating surfaces with paper cutouts. You can transform many different things – boxes, trays, coasters – into beautiful artworks to keep and treasure or giveaway as gifts that your friends will surely appreciate. Another one of my friends is expecting and this time, instead of making something from someone else’s pattern, I decided to make a pattern myself! It turned out so adorable that I decided to share the pattern with you. Fear not my fellow nerd lovers!!! 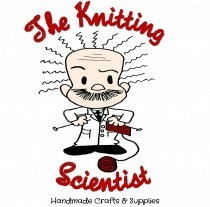 It will all be accompanied by the usual scent of science nerdiness that your dearest Knitting Scientist has accustomed you to!! !